American history is replete with narratives of immigrants who came to America in search of a better life. In spite of obstacles and challenges, for many the journey has proven worthwhile. 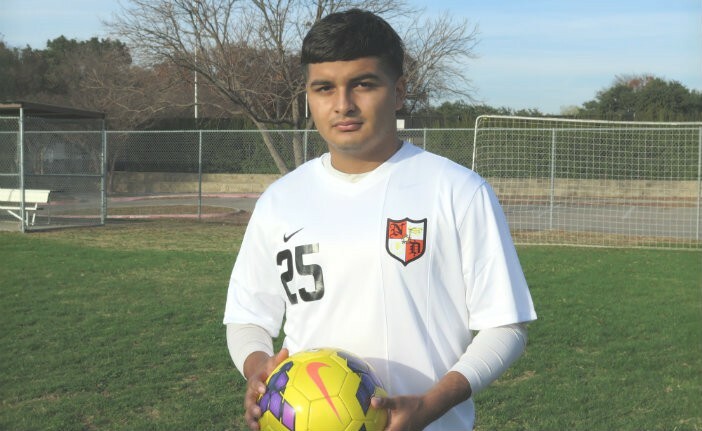 North Dallas High School student and soccer athlete Ricardo Gonzalez has hope he will join the legion of success stories. He was born into a family of modest means who immigrated from León, Guanajuato, México, where much of the city’s economic stability rests upon the labor of factory workers who produce leather, shoes and cars. Through all the changes involved in making an 885-mile move from his home in León to Texas, soccer was a constant for Ricardo who took up the sport when he was four. Like many young athletes, Ricardo saw his success in the sport as a ticket to a bright future. It was Coach Brad Namdar at North Dallas High School who helped him understand he could not rely on his soccer talents alone to realize his dreams of a college education. Instead, with his coach’s support, he now knows that pursuing academic achievement is the most promising route to a better life. Maria said she encourages Ricardo, the eldest of her four children, to finish college despite his desire to play professional soccer. She often reminds him that his education will equip him to better provide for his family and set an example for his three younger brothers. Namdar describes Ricardo as “a young man who thirsts for opportunity,” and the coach says he believes if given the resources and support from his team, school, district and family, Gonzalez has every chance for success. “He’s dedicated. He works hard on the field both technically and tactically, and is always very respectful, setting an example for many of the players by demonstrating despite adversity, you can do what is important to you.” Namdar says that what sets Ricardo apart is his desire to learn, to ask questions and the ability to look at the game, at situations, at life, from a broad perspective. Many are beginning to take notice of Ricardo’s efforts. He was recently named Univision’s Student of the Week, and is also in the running for Futbol Mundial’s Best of the Best Scholarship Award that recognizes athletes who demonstrate quality academic and athletic attributes.